Who but P.G. Wodehouse could have extracted high comedy from the most noble and ancient game of golf? And who else could have combined this comedy with a real appreciation of the game, drawn from personal experience? Wodehouse's brilliant but human brand of humor is perfectly suited to these stories of love, rivalry, revenge, and fulfillment on the links. While the Oldest Member sits in the clubhouse quoting Marcus Aurelius on patience and wisdom, outside on the green the fiercest human passions burn. All kinds of human life are here, from the cocky professional Sandy McHoots to the shy Ramsden Waters, whose only consolation is golf. Even golf-haters will not be able to resist stories that so perfectly blend physical farce with verbal wit and a gallery of unforgettable characters. I Don't Golf. But I Can't Stop Listening. Like Kevin, Wodehouse's golf sagas used to leave me a bit tepid. I've only played one complete round of golf in my life and then it was a foursome playing best ball--and the best ball was rarely mine. But that single experience has helped me to understand that Wodehouse speaks sooth: when you DO hit the ball right (and I did once, purely by accident, a low, raking drive that went at least two thirds the distance of the fairway), you really do want to stop everything, untangle yourself and try to recollect what you did right. An impossible assignment, but there it is. But more than that, though these are "golf stories" I've come to see that they really aren't about golf. They're about people who happen to play golf. Just as the Bertie and Jeeves stories revolve around a young, well-off man about town who likes to hang around the Drones and avoid his Aunt Agatha, these are humorous tales in which golf is the grist in the mill. The way these characters are steeped in golf--how they express their ideas and emotions (from insults to proposals of marriage) almost entirely in terms of golf--is not only funny but, again, not so very far off from the truth. Just think of any avid golfer you know. Then, of course, there is Frederick Davidson's languid but never bored or boring delivery. His readings are usually at least an hour longer than those of, say, Jonathan Cecil reading the same book and it is time well spent; Davidson uses it to get all the juice out of every line. Both as a book (one of Wodehouse's best) and a performance (one of Davidson''s best) this is a must-have. This is fun, like all Wodehouse titles, but be aware that this is one of his stroke-by-stroke golfing titles. There are plots woven about these golf games, but buyer beware if you have a low tolerance for details of each club and hole played at the "Oldest Member's" club. I'm not a golfer, but I enjoyed these tales from Wodehouse. Most are "told" by the Oldest Member, usually to some poor guy who is disheartened by his golf game, although the last story is "historical." Awesome storytelling once again by PG!! Even if you don't like golf you'll enjoy this read. Some funny moments, but not as rich as the Wooster Wodehouse masterpieces. Still, any combination of Wodehouse and Davidson is a treat. brings his enormous gifts as a stylist, concocter of seamless plots, and deployer of metaphors and similes to bear on golf which was one of his pursuits. 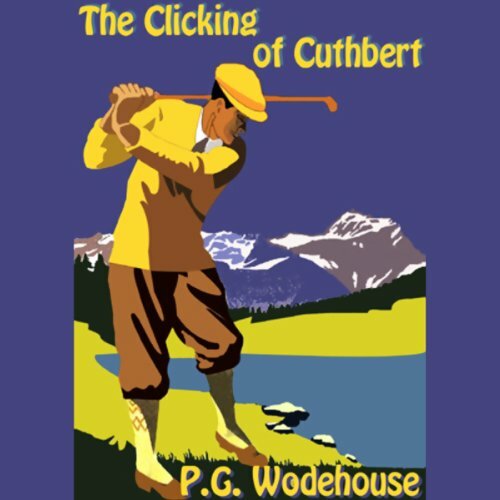 Wodehouse came to golf in his thirties and like some of his characters was bitten hard by the golf bug. As a first rate humorist and third rate golfer Wodehouse was able to delve into the heart of this obsession and to get even with the game on the written page in a way he never could on the course. As I said in an earlier review, if you are a golfer with a smidgen of self awareness you will find aspects of your personality in thee stories. Wodehouse knew golf but he knew golfers even better. I was not as happy with with narrator as I was with Cecil who did Heart of a Goof, but it is well done. Highly recommended. Only the narrator, the stories are very entertaining. What was one of the most memorable moments of The Clicking of Cuthbert? All of the stories are very well written. There is no author of the genre to compare with P G Wodehouse. The narrator sounds too pompous. I prefer the delivery of Jonathon Cecil.